Scattered throughout the scrapbooks of William T. Hornaday is ephemera from the Boone and Crockett Club. Founded in 1887 by Theodore Roosevelt and George Bird Grinnell, the Boone and Crockett Club formed, as they later stated in their 1923 certificate of incorporation, “to promote the conservation and management of wildlife, especially big game, and its habitat, to preserve and encourage hunting and to maintain the highest ethical standards of fair chase and sportsmanship in North America.” Boone and Crockett was originally organized as a very exclusive club, accepting only members in high social and cultural standing, all of whom must have personally hunted a pre-requisite breadth of wild game. Its founding members felt that Daniel Boone and Davy Crockett were responsible hunters who realized the consequences of harvesting game. The club, therefore, became a platform for American conservation, eliminating commercial market hunting, and working extensively for the expansion and protection of Yellowstone National Park. In 1895, members of the Boone and Crockett Club established the New York Zoological Society. A year later, NYZS appointed Hornaday as director of the New York Zoological Park. Although he shared the Club’s commitment to conservation, Hornaday didn’t always agree with how the Boone and Crockett Club’s sought to implement this commitment. For instance, like Hornaday, the Club fought for the protection of migratory birds through legislation passed during the 1910s and 1920s. Yet , they opposed further restrictions on bag limits, (the number of animals that can be killed). Hornaday, on the other hand, fought hard to get the Migratory Bird Treaty Act of 1918 amended to include greater restrictions on bag limits. 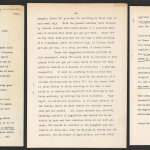 A letter to Senator William H. King, dated April 27, 1926, and included in Volume 9 of the Hornaday scrapbook collection, illustrates the Club’s opposition to further bag limits. Letter from Hayward Cutting, Boone and Crockett Club, to Senator William H. King, 1926 April 27. In their letter to King, the Boone and Crockett Club express their belief that further restrictions were unnecessary; they called attention to the reduction of a maximum forty-five birds killed per week in State “A” as opposed to the already set forth standard of ninety birds killed per week in State “B,” and they called this state-to-state distinction a “glaring inequality.” For the Club, judgement and discretion were more important than hard and fast regulations set by the federal government. Furthermore, the Boone and Crockett Club feared alienating the country’s sportsmen, an anxiety revealed in their letter to King. On the other hand, Hornaday (once a big game hunter himself) had put down his guns and instead picked up his pens. His scrapbooks repeatedly document his written outrage at the nation’s sportsman and the decline of North America’s wildlife at their hands. His voluminous correspondence and appearances in the press demonstrate his desire for appropriate legislation to be put in place. Hornaday knew he couldn’t cease all hunting, but he fought for stronger restrictions to secure the future of wildlife.